Solidor is the fastest growing composite door company in the UK, spurred by consumer demand for a 'better front door'. 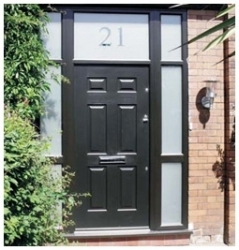 We manufacture high quality composite doors which are packed with features and market firsts you won't find anywhere else. Unique colours, exclusive high security hardware, and beautiful designs help installers go beyond homeowner expectations and stand out in the competitive composite door market. We continue to invest in new materials and in a product development programme to ensure we, and in turn, our customers stay ahead of the pack. Some Solidor industry firsts include new colours such as Duck Egg Blue, the Avantis locking system, and a range of antique style hardware. We also offer the market's most comprehensive environmental policy, we've called it our 'Green Promise'. Solidor Ltd have not provided their accreditations. Solidor Ltd have not provided their brand/trade names. Solidor Ltd do not have any listed keywords. Solidor Ltd have not listed any of their products. Solidor Ltd have not provided any of their downloadable files. Solidor Ltd do not have any news. Solidor Ltd have not provided any YouTube videos. Locations associated with Solidor Ltd.